April is blooming with a bouquet of education-themed activities and celebrations. Our spring round-up includes something for everyone, from online courses for child care providers and ways to inspire engagement in the math classroom, to the history of parks and protecting the environment. Gain knowledge, career-relevant skills and practice that can immediately be applied in early learning programs with MPT’s self-paced online courses. Earn MSDE-approved Core of Knowledge clock hours from the comforts of home, or on-the-go. Learn more and enroll today! Join MPT for a FREE morning of professional development and earn 3 MSDE-approved clock hours. Break free from the typical conference-style sessions and try something new! Come network with your peers and discuss best practices in early childhood development. Set off on imaginative math missions using PBS KIDS Afterschool Adventures. Chock-full of videos, games and hands-on activities, each learning excursion helps children and students practice early math skills alongside their favorite characters from PBS KIDS shows. Basketball, cake design, and landscape architecture have one thing in common. Math! That’s right, you can show your students how useful math is in everyday life with our collection of interactive lessons that focus on real-life topics. Help students strengthen their conceptual understanding and see connections between school and real-world situations using modeling in the classroom. MPT’s self-paced professional development modules are organized by grade bands, and include objectives, videos and online activities. Pop on over to PBS LearningMedia’s online portal for thousands of free, high quality videos, lesson plans, and digital resources for your math classroom. Explore the power of language, look at the world with a fresh sense of wonder, and build reading and writing skills. These video segments, drawn from the PBS Poetry Everywhere series, capture some of the voices of poetry, past and present. Are you teaching poetry in class? Thinkport has an online tool to help students analyze passages of text, lines of poetry, or any piece of content you choose. Designed with an entry point and options for both teachers and students, MPT's digital resource includes embedded virtual markers to highlight specific words or blocks of text, and a place for adding comments. Earth Day is coming April 22. Plan ahead in your classroom and use the following interactive resources to deepen student learning and engagement around our precious environment. Explore the history of America’s parks with your students using primary source documents from the Library of Congress as the setting for learning. Through the examination of maps, films, and photographs, students deepen understanding around the conservation movement of the Progressive Era, Theodore Roosevelt's contributions, and the creation of the National Parks from 1898-1929. Human activity leaves a mark on our environment, from greenhouse gases to our carbon footprint. In MPT’s interactive STEM module, students conduct research about energy use, design a public service announcement, and write a personal conservation commitment. It’s Maryland’s Birthday weekend. Get out and have some fun in Annapolis and surrounding areas. Celebrate Maryland’s heritage, culture and arts. Best of all, many events are FREE or just one dollar! 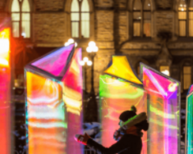 Come and explore Light City, the nation's only large-scale international light and ideas festival. Experience Baltimore's brilliance during the three-part event starting with Neighborhood Lights from April 6-8, followed by the Light City art and music festival on April 14-21, and concluding with Labs@LightCity from April 18-21.